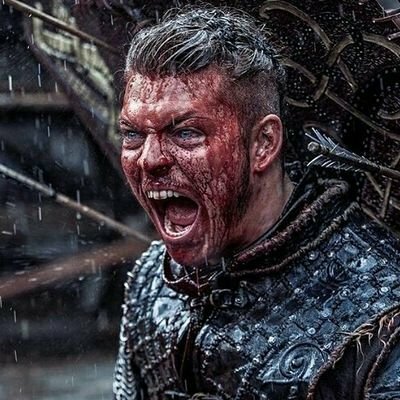 Alex Hogh Anderson (Ivar) of Vikings discusses Season 5! Is anyone excited for the premier of Vikings, Season 5? We here at WNA sure are! To get you all ready for Wednesday’s big 2 hour show, we sat down with Alex Hogh Anderson (Ivar the Boneless) to discuss what is in store for his character this season, and what it is like playing such a complex man. Q: Ragnar had told Ivar that he needs to use his anger differently; do you think that Ivar is capable of doing that? Alex Høgh Andersen: Yes. I think he’s capable of doing that. But when we killed his dear brother Sigurd, he lost control of himself. He let his emotions take over, and I think he understands that is his massive weakness. He is sometimes too driven by his emotions and they can take over and make him lose control. I think that is part of the reason why he has so much in remorse in the beginning of Season 5. He knows that the killing of his own brother created a wound between him and his brothers that I don’t think he will be able to ever heal again. And I think part of it is him also realizing that he lost control– and he let everyone see it. I think you will see him try his very best to control his emotions throughout the upcoming season. Q: How do you think Ivar’s really changed going into Season 5? I mean is he – do you think he’s more of a leader? What do you think has changed about his personality? Andersen: I don’t know if that much has changed. Of course being part of the leading group of the Great Heathen Army has obviously matured him. 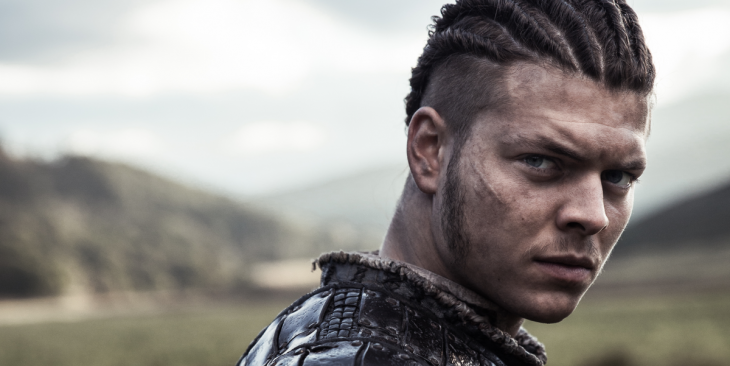 You will see a way more mature Ivar as much as it is possible, but he is still the same determined young man. In Season 4 I would describe him as a boy, and I think he’s becoming a young man throughout Season 5. The whole responsibility of leading a Great Heathen Army takes a toll on a human being. I think Ivar is ready, but it is a challenge and he’s going to have to learn from the mistakes that he’s going to make. Q: I know earlier you were speaking about how Ivar lost control and killed Sigurd, causing the riff between him and his brothers. Can you talk a little bit more about how Ivar’s relationship is going to be with his brothers, and how that kind of stands going into Season 5 and if that’s going to deteriorate? Andersen: As you said there was a riff already, and I don’t think that he’s capable of healing it again. In the beginning of Season 5 you will see him being genuinely sorry, and he tells his brothers that. But is that a way of him manipulating them and trying to make them feel sorry for him? Or is it a way to bring them onto his team so he can control them? I think he’s aware of the fact that he needs them to reach his goals. I think you will see a lot of discussions between the brothers, a lot of unspoken things– a lot of love and also hate. Those are the scenes that I think all of us, all of the brothers, really love to shoot because they’re very intense and there’s a lot of drama. But – do they still love each other or is that bridge burned? That’s the real question. I think it’s our greatest goal as actors to always keep the audience guessing, and for me especially with Ivar because he is such an extreme and manipulative character. My main objective is to keep him balanced and to have scenes like in the beginning of Season 5 where he’s genuinely sorry for his actions and that he almost hates himself right? I think that’s the key of this whole relationship. Q: Ivar is an interesting character because he is ambitious and motivated to succeed in a system that’s built not to generally respect or honor differently abled people. But he has, for the most part, seen a lot of success. And I’d like to know why you think that is? And whether you think if he’s going to continue to succeed despite his flaws and his weaknesses? Andersen: Well I think he succeeds because he’s so intelligent. People know that he has his flaws and he knows that he has his flaws. When he shows up on the day of proving yourself, on the day of battle and when everybody’s life is at stakes, he’s the one organizing the whole thing. I think actions speak louder than words. Some of his actions are good and some of his actions are so very, very bad. But I think you also have to remember that this is in the Viking era where death is a way bigger part of life. It’s way more acceptable. I mean Vikings grew up only thinking about death and how to die so they could get into Valhalla. So even though it sounds horrible in contemporary minds, him killing his brothers is probably not that big of a deal. Of course it’s horrible– but I mean people with no personal relation who only see him as a leader probably didn’t give a damn. All they care about at the end of the day is winning the next battle or dying in a tremendous, beautiful, Viking way. 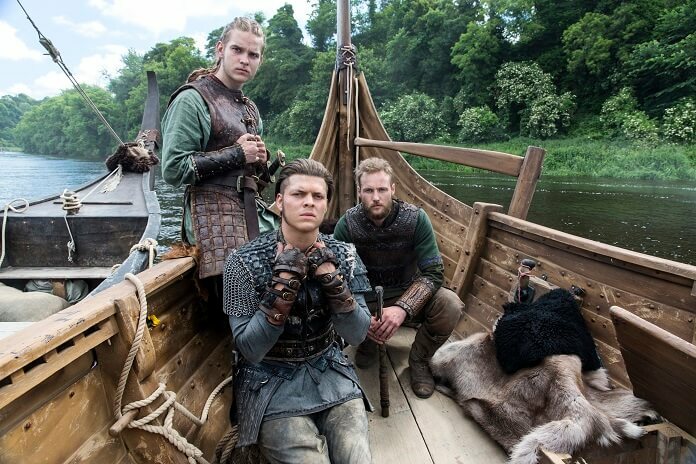 The Great Heathen Army understand that Ivar is probably the one that will get them there in the best way. Ivar is just becoming more and more confident, and rightfully so. That makes him very, very dangerous. Q: Going into the season, how will Ivar’s relationship with Lagertha will be affected? Now that he’s rising to power – are they going to see a little bit of power struggle? Will that dynamic shift during this upcoming string of episodes? Andersen: Oh definitely, definitely. I think it’s great, because Lagertha is maybe the complete opposite of Ivar. She is such a great, perfect and humane character. It’s great to see those two characters clash and see this wild and crazy guy who’s so determined and probably only thinks about himself, against this power woman who’s all about the people. There’s going to be a massive power struggle. This whole Civil War is going to be very, very intense and it is Vikings fighting Vikings. I remember when we read the scripts, wondering where this whole thing was going– when we started to realize that there was going to be a Civil War, the biggest talk was if the audience going to like this. They want to see Vikings against Saxons– or whoever right? So it’s very, very interesting. I’m very excited to see how the audience is going to take this. We did our best, and I have a great feeling about it. The stuff that we shot looks amazing. This season in particular is probably the biggest we’ve ever done; and I can’t wait to see the stuff myself. I haven’t seen any of it. Q: Ivar is an antihero but also is filling the void left by Ragnar. How do you approach marking him sympathetic or likable or is that even possible? Andersen: It’s a big struggle with Ivar and has always been. It’s a great thing you mention Ragnar because he was an antihero, but more hero than anti. I think Ivar’s a bit more of the opposite. He is an antihero with an emphasis on anti. That’s a great thing, because I love to challenge the audience. That’s the whole point of the art– to make people actually think and not to sit down and be relaxed. Bet yes he is – he’s quite difficult to make people feel sympathy for him. Michael [head writer] and I are both aware that we need him to have these small scenes once in awhile where we see the real human within him. Otherwise you will become one dimensional and that’s the worst thing I know. There is the whole physicality of him, as well. I believe that every single time we see him crawl it’s a constant reminder of what he’s been through, and what he’s dealing with on a daily basis. I think it’s hard for people to fathom what he’s been through– It’s hard for me and I’m playing the dude. If I have the chance to either choreograph the scene in a way that makes it obvious that he’s crippled, or you create a reminder that this is what he’s been through and what he’s dealing with, I think that’s one way to keep him as being an antihero so to speak. But there’s still good in him; there’s empathy in him. But yes it’s a challenge. On the outside he’s a controlled maniac, but on the inside he’s a poor boy. So for me I’ve never had trouble having sympathy for him. I think that if I ever lose that, I think the audience will as well. Q: Bishop Heahmund, played by Jonathan Rhys Meyers, is being introduced as kind of an adversary to Ivar. I was hoping you could speak to that a little bit and in what ways this character is a formidable adversary. Andersen: Jonathan Rhys Meyers, who plays Bishop Heahmund, is phenomenal. So it’s a great, great pleasure working with him. He is outstanding. And he’s so intense. When Michael told me about the idea of bringing him in, I thought it was great. He needs to have some enemy that is just as extreme, but for a different cause. Johnny really, really brings that to the table. Having these two characters square off together is phenomenal, and you’ll see a lot of scenes with these two together. I think what’s very interesting with the two characters is that they understand each other. You’ll see that there’s mutual respect between these two guys.The dynamic between these two strong characters I think is going to be very interesting. I believe that some of the stuff that we shot when they were squaring off is going to be very, very good. I have a great feeling about it. Q: Can you tell us a little bit about how you got the role of Ivar? Andersen: I didn’t even audition for Ivar actually. I was auditioning for all of the other brothers until Frank Moiselle, the Casting Director, poked me on the shoulder and told me that I should read for Ivar. When I got the part, I had to ask my agent which brother I was because I literally had no clue. So to take on Ivar was quite an undertaking in the beginning– he’s such a complicated character. I’m so privileged to have been able to work with him on a daily basis. He’s a gift really. Of course there’s a lot of research, in terms of understanding his disease. It’s a very authentic show, and it takes pride in being authentic. So when I’m portraying a character that suffers from a real-life disease, I need to be as authentic as well. And that is – has been since day one in the back of my head with every single thing that I do. I’m so limited in my acting because of his disease. I just can’t go and do this, or do that, or anything because he can’t walk. Second of all, if you’ve been crippled for your entire life you’re also used to the fact that you would get other people to do stuff for you. So it was – it’s been quite frustrating actually, to not be able to choreograph your scenes. Also the technique of acting is a bit different, because you have to compensate with your upper body acting wise, since you can’t use your full body. It’s a learning experience. It really, really is. It’s tough to be so limited but such a learning experience. And I’m very grateful for it actually. Q: I wanted to go back and talk about San Diego Comic Con this year because History Channel did an amazing thing where they let the audience experience a Viking funeral for the character of Ragnar. Getting to watch you and the cast interact with the audience was really, really cool. Did you find the same catharsis, experiencing that as the fans and the audience did? Andersen: It was absolutely amazing. I’m so happy you bring that up because at this stage all I’ve been doing until Comic Con was working on this show nonstop, because Season 5 was 20 episodes. We shot that for 11 months straight almost. I never had the proper interaction with the audience I’m so familiar with, and that’s nothing compared to meeting people in real life. It was just an extraordinary experience to see how happy people were, and how much they loved the show. It was very, very overwhelming. It’s a day that I will definitely never forget. I was a nervous wreck sitting at the panel, trying to sound clever, and smart, and charming, and intelligent in English is a challenge alone for me. To see 2000, 3000 people showing up just to the panel was just crazy. Then we went to the funeral– oh my God that was almost even worse. It was phenomenal. It was such a phenomenal experience. People were so nice, and happy and appreciative. I was even more appreciative of that day, and for all the people that showed up. It was a great experience. It really does is it makes all the hard work that we do, all the crawling through mud in February– it makes all that stuff worth it. You really feel – I really felt alive that day. It was extraordinary. Don’t forget to watch Vikings Season 5, starting with the 2 hour premier on November 29, on the History Channel! Mr. Andersen, you look like Elvis Presley!